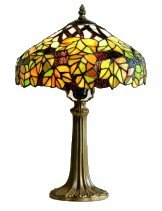 Cut glass hand made traditional Tiffany ceiling lights including the famous Dragonfly, Raindrop and Mackintosh designs. 12 Inch glass shade with a Green Maple Leaf design. Requires 1x60w BC bulb (not supplied), approx dimensions are height 45cm (18 inches), shade diameter 30cm (12 inches). 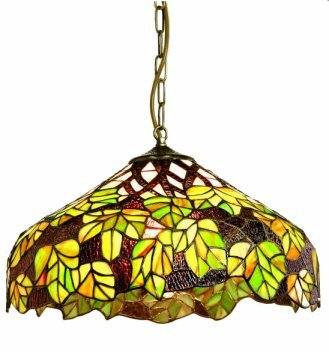 16 inch Tiffany Pendant ceiling shade in a Green Maple Leaf design. Requires 1x100w BC bulb (not supplied), approx dimensions are height 22cm (9 inches), shade diameter 40cm (16 inches).